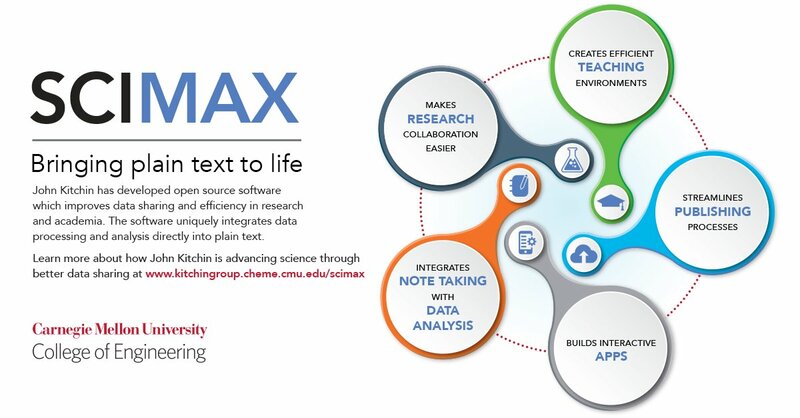 We use scimax as an electronic notebook in all our research. scimax lets us integrate narrative text with citations about what we are trying to do with data and code to perform analysis. scimax integrates project/task management tools and distributed version control tools to enable collaboration in our group. You can see a precursor to scimax in this presentation at Scipy-2013. We write all our scientific manuscripts using scimax. After the documents are written, we use scimax to convert them to the format required by publishers (usually LaTeX). These manuscripts and their supporting information files contain all the data, code and analysis we used in the papers so others can see what we did, and even reuse the data/code. We have written two large electronic books using scimax. These books integrate narrative discussion with code, data, equations, figures, tables and citations. In the native format, they are interactive and functional. Finally, this blog is written using scimax. We have built two significant apps on top of the tools in scimax. org-ref is a bibliography management tool similar to Endnote. It provides tools to insert citations and bibliographies in documents. The citations are hyper-functional, and connect your documents to external search engines, locally stored pdf files, etc. techela is a tool based on scimax that acts like a content management system for teaching a class. It provides a framework to distribute, collect, grade and return assignments and course materials. techela provides an integrated gradebook, and communication tools. Here is a video of this tool in the precursor to scimax. [boes-2015-estim-bulk-si] Jacob Boes, Gamze Gumuslu, James Miller, Andrew, Gellman & John Kitchin, Supporting Information: Estimating Bulk-Composition-Dependent \ceH2 Adsorption Energies on \ceCu_xPd_1-x Alloy (111) Surfaces, ACS Catalysis, 5, 1020-1026 (2015). link. doi. [xu-2015-relat] Zhongnan Xu & John Kitchin, Relationships Between the Surface Electronic and Chemical Properties of Doped 4d and 5d Late Transition Metal Dioxides, The Journal of Chemical Physics, 142(10), 104703 (2015). link. doi. [xu-2015-tunin-oxide] Zhongnan Xu & John R Kitchin, Tuning Oxide Activity Through Modification of the Crystal and Electronic Structure: From Strain To Potential Polymorphs, Phys. Chem. Chem. Phys., 17, 28943-28949 (2015). link. doi. [geng-2017-first-princ] Feiyang Geng, Jacob Boes & John Kitchin, First-Principles Study of the Cu-Pd Phase Diagram, Calphad, 56, 224-229 (2017). link. doi. [wang-2018-densit-funct] Chen Wang, Akshay Tharval & John Kitchin, A Density Functional Theory Parameterised Neural Network Model of Zirconia, Molecular Simulation, nil(nil), 1-8 (2018). link. doi. [gao-2018-model-pallad] Tianyu Gao & John Kitchin, Modeling Palladium Surfaces With Density Functional Theory, Neural Networks and Molecular Dynamics, Catalysis Today, nil(nil), nil (2018). link. doi. [thirumalai-2018-inves-react] Hari Thirumalai & John Kitchin, Investigating the Reactivity of Single Atom Alloys Using Density Functional Theory, Topics in Catalysis, nil(nil), nil (2018). link. doi. [kitchin-2018-machin-learn-catal] John Kitchin, Machine Learning in Catalysis, Nature Catalysis, 1(4), 230-232 (2018). link. doi.